What do I think about the cover design? I’m into it. Though, it bothers me that the cover doesn’t feature a turntable. It’s an extremely huge part of the story. I didn’t understand, at first, that the headphones were there to emphasize music. When I did, I thought it was weird that it wasn’t as clear. Would I buy this book based on the cover? YES. I own a copy, so. What do I think about the cover design? It’s a decent design? It’s simple and focus on what’s important. 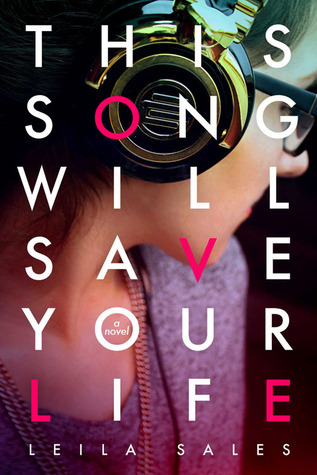 It’s telling you that music is what save the main character’s life. I love the colors and how it complements each other. And that turntable! I’m so happy to see it here. 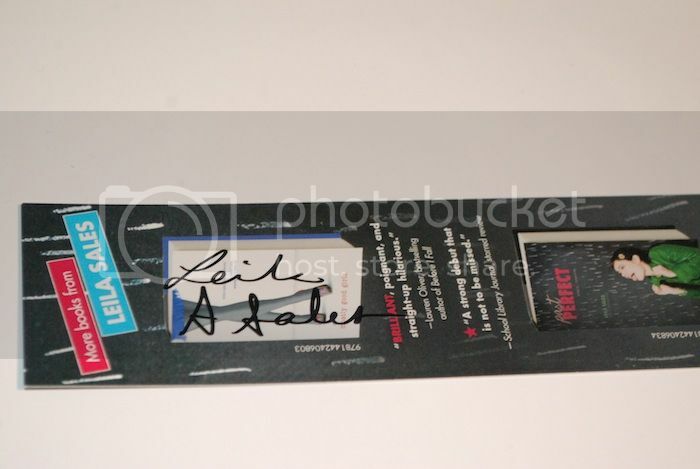 The hardcover was missing this important image. But it’s not my favorite cover of This Song Will Save Your Life. I don’t like the black background. It’s good that it makes the colors, the title, and the turntable the focal point, but for some odd reason, it gives me a headache because it makes the cover look a bit dated. Also, I don’t like how the colors are angled. I just wished it was more three-dimensional. Would I buy this book based on the cover? Nope. Not for me. 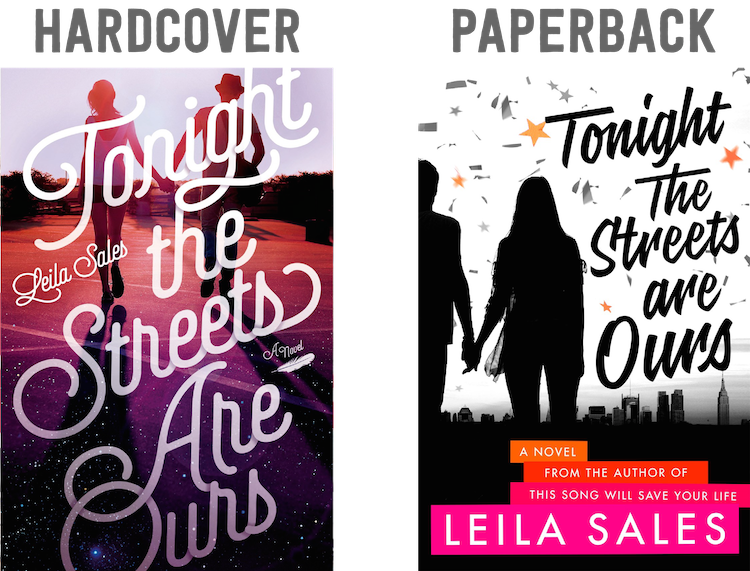 Which cover design do you prefer? 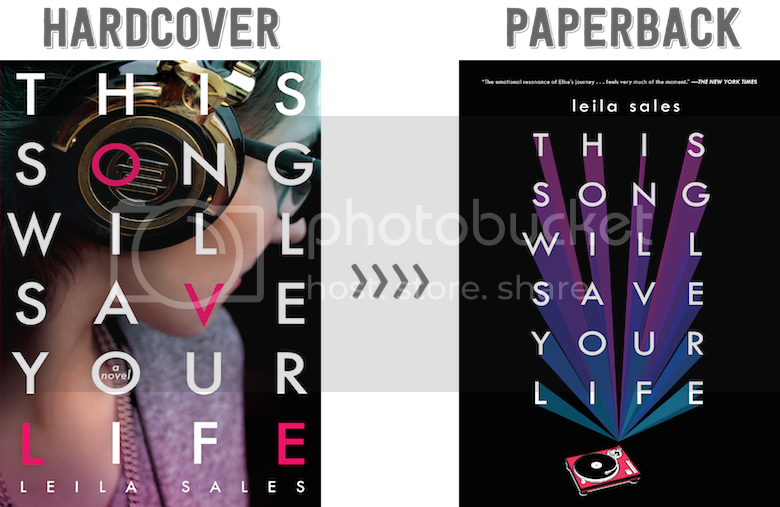 Would you buy the hardcover or paperback cover? 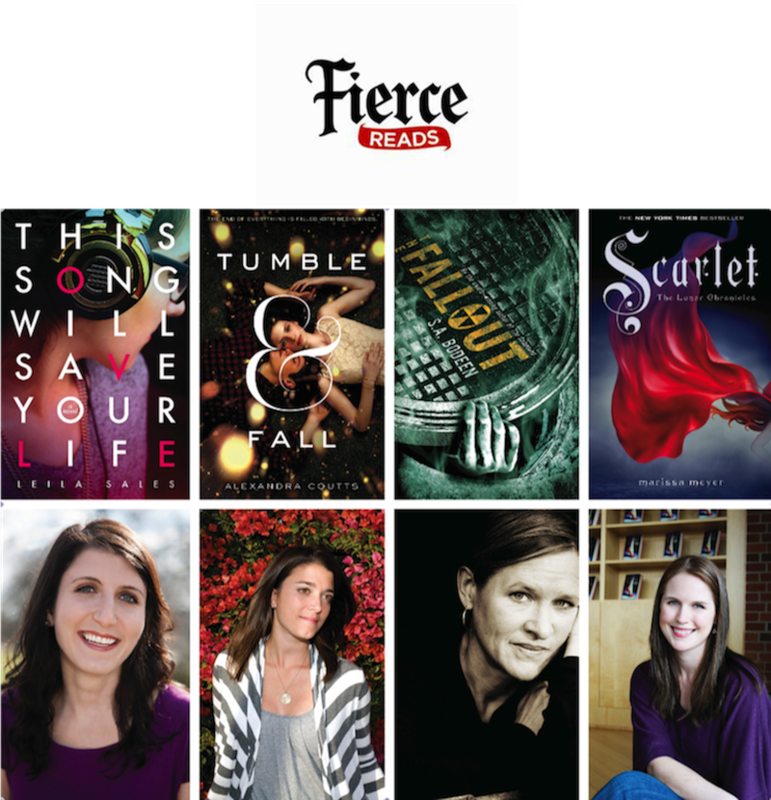 Yesterday, I went to the Fierce Reads event. IT WAS FRICKIN’ AWESOME. It was a fabulous event. I arrived an hour early, before the staff at the bookstore even set up the chairs. I spent my time browsing the store, and when they finally set up the chairs, I took a seat in front of the four chairs (that the authors would be sitting). I was actually an arm away from the authors. (See, at the bottom picture, literally an arm away. Such a great seat!) I had been initially worried and nervous about talking to people because I feel awkward, but the people there were friendly. A woman, whose name I forgot (sorry! ), let me read her Cress ARC before the event and the seven chapters that I read, frickin’ amazing. I need that book in my life! This was the first Fierce Reads event that the authors did not have a moderator, so they decided to ask questions to each other that they wanted to know and then opened the questions up to audience. 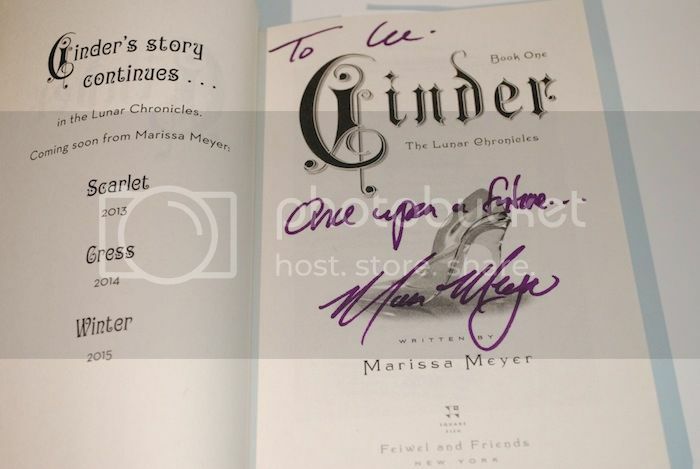 Marissa Meyer (MM): Cinder and Scarlet would be Gryffindor because they’re no-nonsense, take no prisoners, willing to get the job done, and brave. Marissa would most likely be a Hufflepuff. S.A. Bodeen (SAB): Eli, the main character in The Compound and The Fallout, would be mistakenly put into Slytherin because Eli’s considered the bad twin. He has done bad things and people would most likely judge Eli for what’s on the surface. Leila Sales (LS): Elise would be put into Slytherin because she thinks she’s terrible because she “has been feed negative ideas of herself over the course of her life from her peers and would have a negative self-imagery of herself.” And terrible people belong in Slytherin, especially if Gryffindor is for brave people, Ravenclaw for smart people, Hufflepuff for nice people, and Slytherin is for terrible people. Alexandra Coutts (AC): All three characters would be in Gryffindor because they would have to be brave to go out into the world despite an asteroid coming. 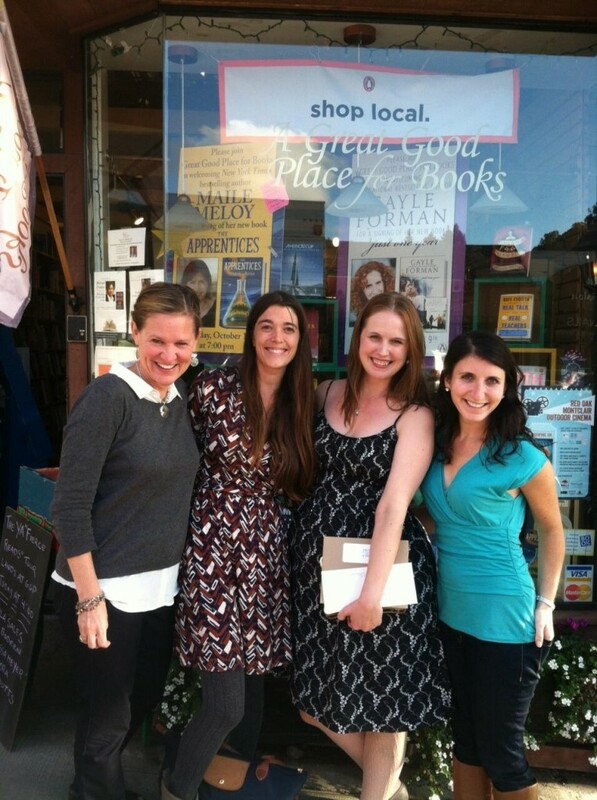 SAB: Being able to hang out with the other authors on the tour. AC: Getting to read during flights. LS: Everybody thinks her book is short, so it’ll be hard to cut anything. MM: Tell people how to live their lives (like Blake Lively – lifestyle curator). Question: To S.A. Bodeen, did your job influence the way you created the male POVs? SAB: She doesn’t know if that influenced her. She finds it pretty amazing that boys like her book and are enjoying reading because of it. Question: What research did you do for your book? AC: For her first book, Wish, she moved to San Francisco for four months (because it’s set there). For Tumble & Fall, she researched about asteroids and watched visual simulations of what would happen if an asteroid hit the Earth. MM: Spaceships, moon colonies (+ how that would work), mind control + actual scientific theory on how you would control people, and cyborgs. Her favorite research moment was when she and her husband got underneath an old Mustang, and he pointed out what everything was. SAB: For The Compound, she researched how to build an atomic bomb. For The Fallout, she researched Doomsday preppers. For The Raft, she went online to look at rafts and survival kits. LS: Went to dance parties to see what people were wearing and how they were dancing. Read things about how to DJ and the technicalities of it. Question: Is there a scene that you wanted to change if you had more time to work on it? SAB: People wanted a sequel to The Compound. She got an idea and drafted up an outline, wrote it, and sent it to her editor. Her editor sent back the first 150 pages and told her to scrape the other half, so S.A. had to rewrite half of the book. AC: The whirlwind romance. People felt it was too fast. Alexandra would make it clearer that Sienna and the boy were responding to what was going on around them (the impending doom). LS: Pleased with her book. Question: What is your writing process? And has that process change from book to book? MM: She’s very chronological writer – never deviates from beginning to end. However, for her third and fourth book, her process changes because she has more characters (+ their subplot) to add, so she finds it easier to jump around more. SAB: Really lousy drafter. She gets it out fast. She’s a good reviser. AC: A combo. Outlines a lot. Very linear. Writes in order. She won’t skip ahead. She can’t move on if something isn’t what she wants it to be. Question: When you sit down to write, do you have any particular rituals you have or items you need? LS: Will not write without chocolate chips nearby. Doesn’t have to be in arms reached. She wants it there because she can potentially eat them if the going gets rough. SAB: A hot drink with her favorite mug. MM: Something to sip at, usually water (or glass of wine in the evening). Has to wear socks because cold feet distract her. AC: Has to wear something comfortable – pajama-esque. SAD: Get an iced-coffee from McDonald’s. Question: What is your favorite book? Leila said she doesn’t have marketable life skills and created an “I don’t have any marketable life skills” Facebook group in college. Marissa worked as a typesetter and a proofreader. S.A. was a social studies teacher. She also taught a middle school geography class that had 18 boys and two girls. Leila loves the song “This Old Heart of Mine” by the Isley Brothers. S.A never intended for The Compound to have a sequel. The ending of This Song Will Save Your Life took Leila a lot of rewrites. 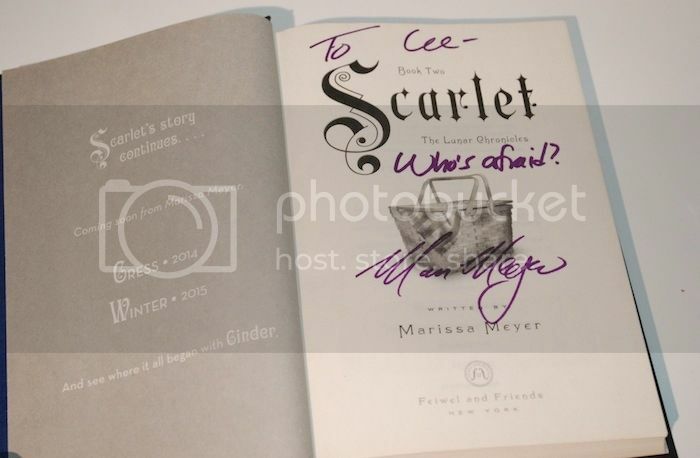 Marissa has a tattoo on her upper back – a stack of books. When she got published, she wanted her tattoo to be a stack of books. She got it a month or two after Cinder came out. Four of the stacked books represent The Lunar Chronicles books and the one on top is everything that will come in the future. Because I couldn’t buy the other author’s books (which I really felt bad about), I made them sign my Moleskine and got a picture taken with each of them. I was pretty much all over the place, but I am extremely happy! It was a fabulous event. Meeting all the authors made me love them to pieces! I love when the main character finds their own niche. And this book is giving me ‘found family’ vibes, which makes me want to shout ‘yeeeesssss.’ I’m excited to see how music is incorporated into this book. I hope there’s a playlist in it because it’s a book about music and why not experience it while we read?